Accommodation in Kathmandu for 4 nights and in Lhasa for 4 nights, on bed & breakfast twin-sharing basis, sightseeing tours of Kathmandu, airport transfer service, all land transportation and sightseeing in and around Lhasa with English speaking local guide and entrance fees. International flight fare US-Kathmandu-US, Kathmnandu-Lhasa- Kathmandu flight fare, Tibet visa fee, Nepal double-entry visa fee, medical evacuation insurance (required), personal medical kit, international airport taxes (if any), excess baggage fees on flights, alcoholic and bottled drinks, optional tips, photography fees inside monasteries, and donations to monasteries and elsewhere. Note: Due to earthquake damage to the road connecting Kodari (Nepal) and Tibet, there is no overland travel between Kathmandu and Lhasa at this time. You may fly between Kathmandu and Lhasa. Your Tibet visa will be arranged in Kathmandu, taking three days to process. During this time, we offer you sightseeing and hotel services in Kathmandu -- with its historical and cultural trans-Himalayan ties, a natural place to begin your pilgrimage visit to Tibet. 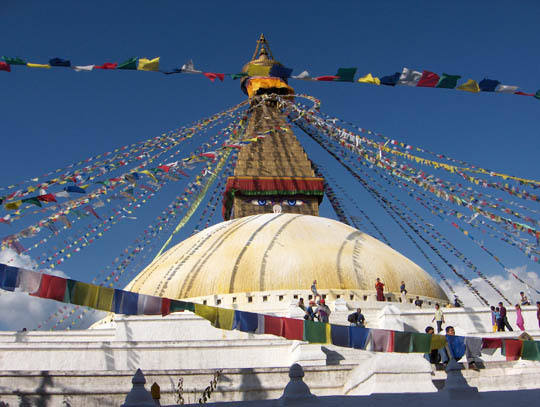 Your trip begins in Kathmandu, Nepal, where you'll visit Bhaktapur and Patan, cities renowned for their medieval charms and richly carved wooden and metal artistry; and the ancient temples of Swayambhunath and Boudhanath, where Tibetan Buddhists gather morning and evening to offer prayers and homage. From Kathmandu, you'll take a spectacular flight over the Himalaya to Lhasa, offering an unparalleled view of Mt. Everest, Makalu and much more (weather permitting). During your visit to Tibet, you’ll tour the massive Potala Palace (left), with its fortress-like walls encasing jewel-studded reliquary chortens honoring a lineage of Tibet’s God-Kings, the Dalai Lamas; and the airy Norbulingka, where His Holiness the present Dalai Lama spent his youthful summers. You’ll visit the historic monastic colleges of the Lhasa Valley, and will stroll along the Barkhor joining devout Buddhists as they circumambulate the ancient Jokhang Temple. Later go inside the butter-lamp blackened halls of the temple. You'll return to Kathmandu by air and either continue your visit in Nepal or travel homeward . Day 1 Arrive in Kathmandu: KarmaQuest staff will meet you at the Tribhuvan International Airport and transfer you to your hotel in downtown Kathmandu (15-20 min. from airport). KarmaQuest staff will collect your passport photos and passport for the Tibet visa. 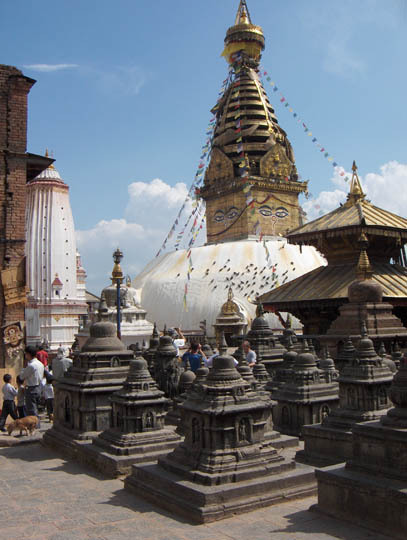 Day 2 Kathmandu: Rise early and join Buddhist pilgrims at Swayambhunath Temple, a holy site since ancient times. Later, visit Kathmandu Durbar Square, and the home of the Living Goddess, the Kumari. Afternoon visit Boudhanath Stupa (left), a giant stupa adorned with lotus-shaped petals and topped by the all-knowing eyes. After, visit Pashupati Temple, the valley’s most important Hindu temple, straddling the holy Bagmati River. Day 3 Kathmandu: Sightseeing in Bhaktapur and Patan. Bhaktapur is a lovely well-preserved medieval city located about 13 km east of Kathmandu city. You’ll enjoy a walk through the cobble stone streets, seeing artisans and some of the most beautiful temple art in Nepal. Patan is another ancient capital city overflowing with temples and an award-winning museum. Day 4 Fly Kathmandu to Lhasa: The Kathmandu to Lhasa flight is a spectacular mountain flight crossing over the Himalaya with a bird’s-eye view of Mt Everest and many Himalayan peaks over 25,000 ft. Arrive in Lhasa and transfer to the hotel. The rest of the day is for you to take easy at this heady 12,000 ft elevation. Days 5 and 6 Lhasa and Environs: Over these two days, you’ll enjoy guided sightseeing tours of the main historic and religious sites of the Lhasa Valley, with time to explore on your own. 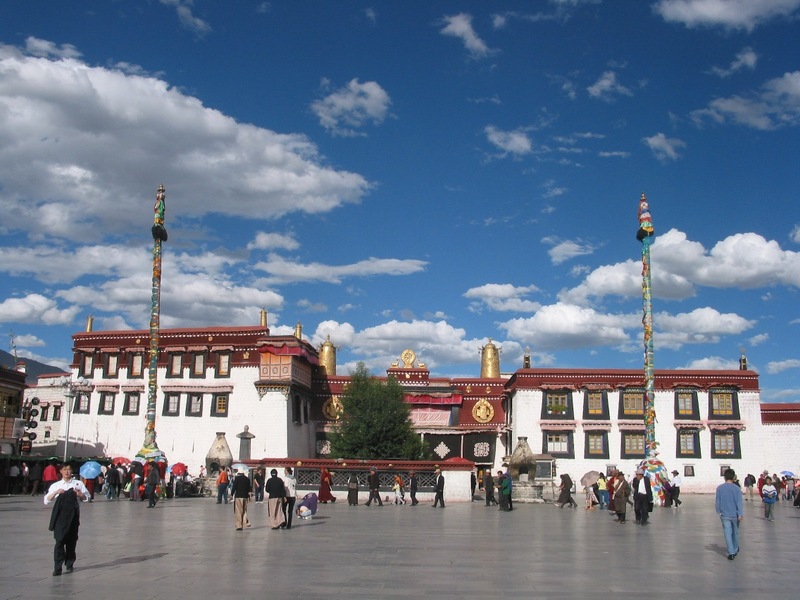 Visit the Jokhang Temple (left) situated in the heart of Old Lhasa, Norbulingka, the summer palace of the Dalai Lama, Sera Monastery, where monks debate the dharma (Buddhist teachings) as they have for centuries; and Drepung Monastery. 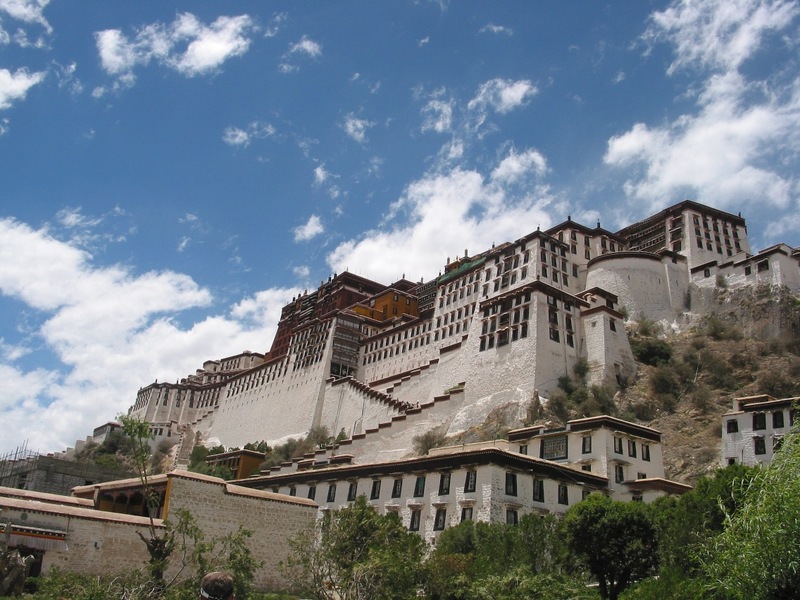 Visit the Potala Palace, an image synonymous with Tibet (left). This 13 story, 1000 room citadel served as the headquarters of the former church-state of Tibet and was home to successive Dalai Lamas. A limited number of rooms are now open to visitors. Day 7 Ganden Monastery: Located east of Lhasa, and once the largest monasteric complex in the Lhasa area, Ganden was destroyed during the Cultural Revolution, and is now largely restored. If you like to walk, take the long kora (path around the monastery complex) for a leisurely several hour hike overlooking the Kichu River at times, passing hundreds of holy sites where Buddhist pilgrims have passed and prayed for millennia. Day 8 Fly back to Kathmandu: Arrive in Kathmandu. KarmaQuest representative staff will receive you at the airport and transfer you to your hotel. The afternoon is free to explore on your own or rest. Overnight in Kathmandu. Optional Extensions in Tibet: Spend a few more days in Tibet and visit Shigatse, and the impressive Tashilhunpo Monastery. Home of Tibet's Panchen Lama, this sprawling complex houses a gigantic Maitreya (Future Buddha) statue. Various other temples in the complex contain ornate reliquary chortens. Continue your drive to Gyantse, once at the crossroads of trade with India. The monastery compound is presided over by the still intact fortress perched atop a nearby mountain. 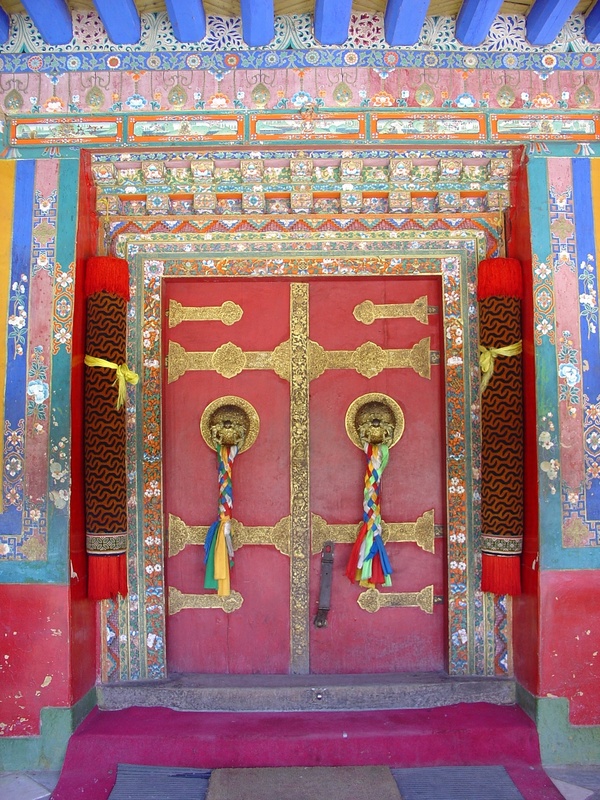 Visit the Kumbum Chorten (shrine) and Palkhor Monastery. Other Extensions are possible, e.g., to Nam Tso, a mammoth holy lake, Samye Monastery, Mt Qomolangma (Everest), and further afield.